The FDIC evolved following the aftermath of the market crash of 1929, when more than 9,000 banks failed between October 1929 and March 1933. The FDIC was formed when the Banking Act of 1933 was signed by President Roosevelt to protect bank depositors against bank insolvencies. Bank failures are a direct result of lagging economic circumstances and a contraction on bank held assets. This is why bank failures skyrocketed during the first few years of the depression, then tapered off once stability was reestablished. Bank failures weren’t an issue for decades until the S&L crisis in the early 90s and the results of the financial crisis of 2008. 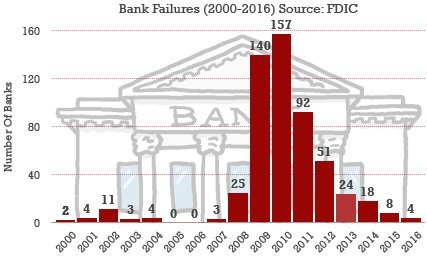 Since 2000, there have been 546 bank failures, the bulk occurring the three years following the crisis of 2008. For the past two years, failures among banks have been minimal. Deposit insurance coverage was initially set at $2,500 in 1934, which has risen to $250,000 today. The current FDIC limit is substantially more than it was in 1934, even on an inflation-adjusted basis. The $2,500 FDIC limit in 1934 is equal to $44,896.83 in today’s dollars.